In the North Atlantic: Invest 96L is an area of disturbed weather in the North Atlantic that has the potential for further tropical development. Invest 97L is an area of disturbed weather in the North Atlantic that has the potential for further tropical development. In the Western Pacific: Typhoon 06w (Nida), located approximately 231 nm north-northeast of Manila, Philippines, is tracking northwestward at 13 knots. India – Rains lashing northern and eastern parts of the country have aggravated the flood situation in Assam, Meghalaya, Bihar and West Bengal, killing around 58 people while lightning strikes in Odisha have claimed 27 lives. Floods in Assam have killed 29 people and affected nearly 37 lakh people across more than 3,300 villages in 28 districts of the state, officials said. According to official reports, flood waters have risen following heavy rainfall in the upper catchment areas of Arunachal Pradesh and Bhutan as well as in the state. In Bihar, many rivers are flowing above danger level as floods continued to wreak havoc, affecting 26.19 lakh people. Two more districts of East Champaran and Muzaffarpur were declared as flood-hit on Saturday. Twenty-six deaths were reported in Bihar due to drowning and home collapses in 10 districts bordering Nepal, news agency AP reported on Saturday. In Odisha, 27 people were killed in lightning strikes — eight from Bhadrak district, seven casualties in Balasore district, five in Khurda, three in Mayurbhanj and one each in Kendrapara, Jajpur, Keonjhar and Nayagarh, police said. In a follow-up to the coverage of the H1N1 influenza outbreak in Panama, the Ministry of Health is advising the public to get vaccinated as more fatalities and hospitalizations are reported (computer translated). Health officials say nearly 3,500 people have required hospitalization and 250 remain hospitalized to date. The World Organisation for Animal Health (OIE) received notification Thursday from the Ministry of Agriculture , NAPLOUSE, Palestinian Auton. Territories about a camelpox outbreak in the West Bank. Seven cases of the viral disease were confirmed in dromedary camels belonging to Bedouins in a very wide area or open desert from Bethlehem to the Dead Sea. Global warming is reputedly causing swathes of jellyfish to flock to British beaches as warmer seas attract the stinging menaces. The number of blooms, when jelly fish mass together, are on the rise in coastal waters, according to the Marine Conservation Society. 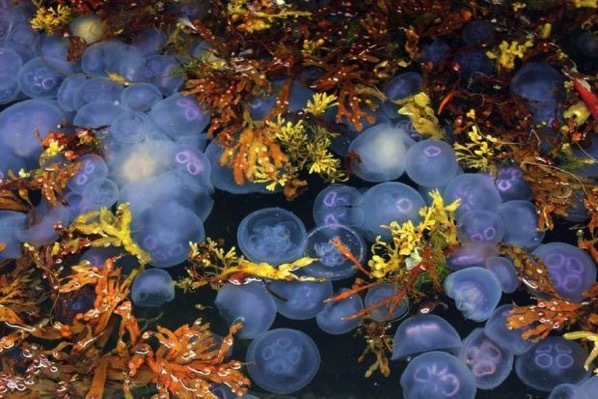 Some scientists argue that jellyfish numbers increase and then decrease normally every 20 years or so, however, others believe and these increases are linked to factors such as pollution, over-fishing and possibly climate change. 7.7 Earthquake hits the Pagan region in the North Mariana Islands. 5.0 Earthquake hits North island, New Zealand. 5.0 Earthquake hits the Pagan region in the North Mariana Islands. Invest 96L is an area of disturbed weather in the North Atlantic that has the potential for further tropical development. Tropical depression 06w (Six), located approximately 318 nm east of Manila, Philippines, is tracking north-northwestward at 18 knots. According to Centers for Disease Control and Prevention (CDC) ArboNET, as of July 7, Zika has been diagnosed in 5,582 people, including 672 pregnant women, in Puerto Rico according to a new report published today in the Morbidity and Mortality Weekly Report (MMWR). Positive tests for people with suspected Zika virus infection have increased from 14 percent in February to 64 percent in June. Positive tests through blood supply screening also increased, reaching 1.8 percent during the latest week of reporting, which started on July 3. Many of the 5,582 people who tested positive for Zika virus infections were tested because they had symptoms of Zika. Because Zika infection during pregnancy can harm the developing fetus, pregnant women in Puerto Rico and other areas where Zika is spreading should be routinely tested during prenatal care whether or not they got sick. Of the 672 pregnant women, 441 (66 percent) experienced symptoms of Zika and 231 (34 percent) had no symptoms. Because approximately 80 percent of people infected with Zika do not have symptoms, the 672 pregnant women with evidence of Zika infection likely represent only a fraction of those who may be infected to date. In addition, 21 people with confirmed or suspected Guillain-Barré syndrome in Puerto Rico had evidence of Zika virus infection or recent unspecified flavivirus infection, and one person died after developing severe thrombocytopenia (low blood platelet count). Four cases of Zika infection in Florida are very likely to have been caused by mosquitoes there, the State Department of Health said Friday — the first documented instances of local transmission in the continental United States. The C.D.C. and Florida officials said that for now, the area of concern is limited to one square mile in the Wynwood neighbourhood of Miami, a gentrifying area with restaurants and art galleries just north of downtown. Researchers had long predicted that the Zika virus would gain a toehold in the continental United States, most likely in Florida and along the Gulf Coast. While the outbreak is not expected to escalate sharply, its course is uncertain. None of the four patients in Miami had traveled to Zika-affected areas in Latin America or the Caribbean. Bezymianny (Central Kamchatka Depression): Last night, Tokyo VAAC reported an ash plume from the volcano at 20:40 UTC, based on satellite data. While it is entirely possible that activity at the lava dome of Bezymianny has picked up or that a collapse occurred which generated an ash plume, it could also be an ash plume from nearby Klyuchevskoy volcano. At the moment, the latter possibility seems more likely. Cloud cover prevented direct observation to confirm whether or not there is new activity at Bezymianny. KVERT has not issued an alert about the latter. Cleveland (Aleutian Islands, Alaska): A recent overflight by staff of the Alaska Volcano Observatory (AVO) showed a small lava dome and active fumaroles inside the volcano’s summit crater. Incandescence could be seen at the vent of the dome, indicating that it is still active even though no explosions or other eruptive activity have taken place recently. The current aviation color code of Cleveland is yellow. Fuego (Guatemala): The paroxysm at Fuego, which had reached its peak phase during the night of Thu-Fri (28-29 July) has ended. Starting from the early afternoon yesterday (local time), activity gradually decreased and the volcano’s activity has by now returned to intermittent smaller strombolian explosions. The lava effusion dropped as well. As of yesterday evening, the two lava flows on the SE side were still active and 1500 m long while explosions at the vent were still reaching 400 meters height; by this morning, the lava flows continued to be active, but had decreased to a few hundred of meters length and are probably going to stop soon. The recent paroxysmal eruptive phase (the 12th in 2016) with pulsating lava fountains and continuous ash emissions had lasted approx. 12 hours at its climax during the night 28-29 and morning of 29 July. It was described as one of the strongest so far this year. Nevado del Ruiz (Colombia): Sporadic, usually small ash emissions continue to occur from time to time (every few days) such as last night (s. image attached). These explosions are likely phreatic in nature, i.e. driven by steam explosions inside the currently unstable hydrothermal system heated by an underlying magma intrusion at shallow depth. On 24 July, Washington VAAC reported a possible ash plume from Ruiz that rose to an altitude of 7.2 km (23,000 ft) a.s.l. On 26 July, an ash plume was detected that rose to an altitude of 6.9 km (22,000 ft) a.s.l. and drifted W.
Piton de la Fournaise (La Réunion): Signs that a new eruption of the volcano in the near future could be in the making have been increasing. In a bulletin yesterday, the volcano observatory (OVPF) reported elevated seismic activity, deformation and gas emissions that are consistent with the rise of magma to shallow depths. The recent seismic unrest began on 13 July; since then, OVPF recorded 163 shallow volcano-tectonic earthquakes (at depths within 2 km below the summit), including two swarms on 19 and 26 July, as well as 226 small collapses and rockfalls in the Dolomieu Crater. Also since 13 July ground inflation at Dolomieu crater (swelling of the edifice caused by magma intrusion) picked up significantly. It currently continues at rates similar to those recorded before the recent eruptions of 2015 and 2016 (rates around 1 mm distance gain / day). Last, but not least, gas measurements also show significant variations: since 21 July, a moderate increase in the average concentrations of H2S emissions has been detected from the summit – a volcanic gas released earlier than magma itself rises to the surface as the gas is very mobile and not very soluble at low pressure (shallow magma depth). Colima (Western Mexico): Intermittent explosions continue at the volcano from time to time, but with comparably low intensity. No or little glow is visible from the volcano’s summit at night, suggesting that the magma column is relatively deep inside the conduit currently. 5.4 Earthquake hits Minahasa, Sulawesi, Indonesia. Migratory birds that have throughout the ages spent the summer in the Arctic may soon find their breeding grounds there too warm and unsuitable because of climate change. The Arctic is now warming faster than most other places on the planet, especially areas that are home to the most visiting bird species — western Alaska and eastern Russia. Scientists from the University of Queensland say that climate change in those areas is already causing the “shrubification” of the tundra and creating an environment that invites such predators as red foxes to move northward. Researcher Hannah Wauchope predicts most Arctic shorebirds won’t be able to breed in the Arctic by 2070. The week’s hottest temperature was 119.0 degrees Fahrenheit (48.3 degrees Celsius) in Abu Dhabi, UAE. The week’s coldest temperature was minus -112.0 degrees Fahrenheit (minus 80.0 degrees Celsius) at Russia’s Vostok Antarctic research station. The area of wildfires in Siberia has grown from 4,700 to 6,500 hectares over the last 24 hours. A total of 47 forest blazes is currently active in the region. Most wildfires were registered on the territory of the Krasnoyarsk Krai. Shiveluch (Kamchatka): The effusive and explosive activity at the volcano continue at currently relatively low levels. Occasional small avalanches occur from the active dome, but little or no glow can be seen on night-time webcam imagery, suggesting that the effusion rate is at the lower end at the moment. Chirpoi (Kurile Islands, Russia): SVERT reported that a thermal anomaly over Snow, a volcano of Chirpoi, was detected in satellite images during 18 and 20-24 July. Steam-and-gas emissions were visible drifting SW on 16 July and may have contained minor amounts of ash. Steam-and-gas emissions during 22-24 July drifted as far as 90 km N. The Aviation Color Code remained at Yellow. Bagana (Bougainville Island, Papua New Guinea): A small ash emission from the volcano was reported yesterday evening. According to Darwin VAAC, a plume at approx. 7,000 ft (2.1 km) altitude extended 35 km west from the volcano. Sinabung (Sumatra, Indonesia): Explosive and effusive activity continue with no significant changes at relatively low level. Almost every day, the lava dome produces small to moderate ash explosions at the summit. Semeru (East Java, Indonesia): During an ongoing tour in East Java, our small group observed glow and mild explosive (strombolian) activity from Semeru volcano’s summit crater. The lava flow in the southern ravine was inactive. Kilauea (Hawai’i): As of yesterday evening (morning in Hawai’i), the new sea entry of the “61G” lava flow near the Kamokuna area continued to be active with and was at least 20 meters wide, spilling over the older sea cliff. It can be expected that the sea entry will widen over time. Another lobe of the main flow has been advancing along the west margin and might hit the ocean soon as well. At the summit and Pu’u ‘O’o crater on the eastern rift zone, no significant changes have occurred. Halema’uma’u lava lake has risen a bit again to approx. 23 m below the crater floor rim and the lava pond inside Pu’u ‘O’o is active as well. Pavlof (Alaska Peninsula, USA): Weak eruptive activity has been observed at the volcano in the form of intense steaming and small ash emissions and the aviation color code was raised to orange yesterday. Most likely, the summit crater vent is currently producing strombolian-type activity, possibly along with the effusion of lava flows. Seismic activity has been elevated. Pacaya (Guatemala): Mild strombolian activity continues from the Mackenney crater. According to a recent report, this activity ejected glowing material to 75 m above the crater and weak incandescence could be observed from the crater at night. Fuego (Guatemala): Another intense eruptive phase with strong explosions, lava fountaining and abundant lava flow activity is in progress at the volcano. After increasing gradually over the past week, the new so-called paroxysm (the 12th such phase in 2016 according to INSIVUMEH) started yesterday morning and seems now to be at its peak. Strombolian-type explosions and/or pulsating lava fountains eject glowing lava to 400 m or more, generating abundant glowing avalanches on the upper cone, and are accompanied by shock waves that can be felt in up to 15 km distance. Two lava flows of each about 2000 m length are descending the Las Lajas and Santa Teresa gullies on the southeastern flank. 5.0 Earthquake hits the Ceram Sea, Indonesia.